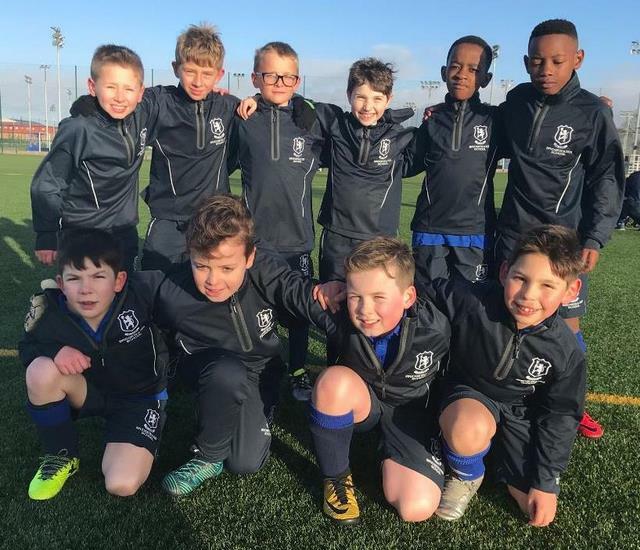 The reward for beating Huddersfield Grammar in the previous round, was an away trip to Queen Ethelburga’s, in the u9’s AJIS Cup Quarter-Finals. The team can be excused a slow start following the two hour trip up to York and it was perhaps no surprise that the hosts scored almost immediately from kick-off. An unusually wasteful pass out of defence played in the York striker, who curled the ball into the top corner of George’s net. Fortunately, this only served to wake Bridgewater up and from that moment on, they totally dominated their shell-shocked opponents. The equaliser definitely calmed the Bridgewater nerves and set the tone for the rest of the game. Matteo held off two defenders before firing low into the hosts net. Moments later, Craig hit the post, followed by Alfie who also saw his shot rebound off the up-right following one of his typical mazy runs out of defence. Jaydon broke down the wing and found Joshua who crossed brilliantly, leaving the Queen Ethelburga’s centreback no choice but to slice the ball into his own net! David scored the third, whilst Jaydon made it 4-1 on the stroke of half- time. The change of ends did not bring a change in the Bridgewater dominance of the game in the second half. On the odd occasion the opponents threatened to score, Harper and Alfie stepped in to break up the attack. Keepers George and Tom were very rarely troubled, thanks to the terrific defending from the team as a whole. Midway through the second half, Bridgewater turned up the heat and scored another 4 goals in quick succession. Alfie got an unstoppable drive from just outside the box, whilst David completed a fine hat trick, with a shot on the turn and a free- kick that rocketed into the top corner. The talented U9’s now move into the AJIS Cup semi-finals with high hopes for a place in the final. If the midfield of Matteo, Joshua and Jaydon can work as hard, whilst Harper and Alfie stay solid at the back, then David and Craig will score goals and who knows what can happen? The team can be very proud of their performance in York whatever happens next in the competition.